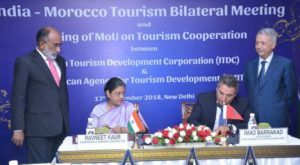 India and Morocco have agreed to give a new momentum to their cooperation ties in the field of tourism industry with a view to increasing tourist arrivals between the two countries. The agreement was sealed during a visit Moroccan tourism minister Mohamed Sajid paid Monday to New Delhi where he met with his Indian peer K. J. Alphons. The two ministers attended the signing ceremony of a Memorandum of Understanding (MoU) between India Tourism Development Corporation (ITDC) and La Societe Marocaine D’Ingenierie Touristique (SMIT). The signatories pledge to share engineering and tourism products development expertise. ITDC and SMIT agree to share data base of potential Indian and Moroccan investors in the tourism sector. They will also cooperate in new trends and technology in tourism products, in innovative tourism product development, marketing and feasibility studies related to the needs and expectations of investors and tourists. The trip to New Delhi was also marked by an agreement between Royal Air Maroc and Air India to increase air connectivity between India and Morocco. Mr. Sajid also announced the opening of Morocco’s first tourism office in New Delhi to boost Moroccan tourism destination. Tourism in Morocco is the second biggest employer after agriculture, while India is the fastest growing outbound market after China with UNTWO expecting 50 million travelers by 2020. 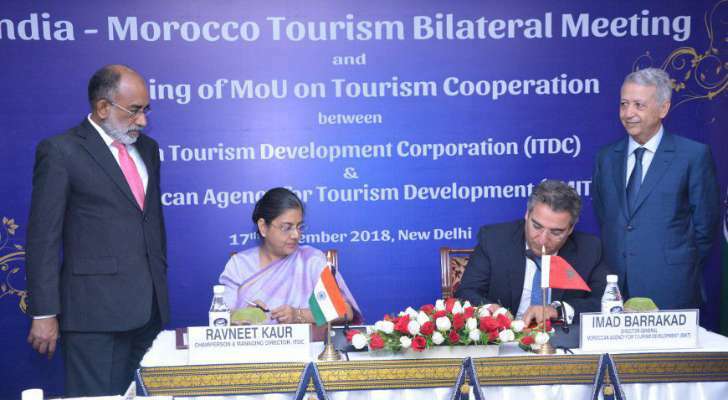 Indian tourists are among the world’s top spenders which will enable Morocco, a very popular destination, to tap into this source market with huge potentials. Posted by Hafid El Fassy on September 19, 2018. Filed under Lifestyle. You can follow any responses to this entry through the RSS 2.0. Both comments and pings are currently closed.